-16 First Class seats at a 204cm (80ins) pitch. -50 Business Class seats at a 152cm (60ins) pitch. -245 Coach class seats at a 107cm (42ins) pitch. All EOAC 747s feature seating in an extremely low density arrangement with meals served on all flights. Separate bars are available for First and Business Class Passengers. 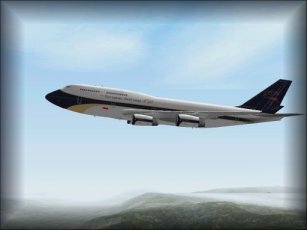 The Boeing 747-400 is the newest and best selling aircraft within the 747 range. The project was launched in October 1985 and the first aircraft flew in August 1988. Despite it's close resemblance to the -300 series the -400 represented a major development. Changes included a completely new six EFIS screen flightdeck allowing two crew operations, new engines, a revised wing incorporating winglets, reduced weight and increased take off weights. Aerodynamic improvements and greater fuel load allowed for a much improved range. A number of variants are now available, including a domestic model (without the winglets) and numerous engine and weight options. First to order the 747-400 were Northwest Airlines on October 22nd 1985. In 1986 British Airways, KLM, Lufthansa, Cathay Pacific and Singapore followed. In 1987 United Airlines and Air France ordered 58 between them and by the time certification was received Boeing had received more than 160 orders from 22 airlines. The world's airlines were lining up for the new jumbo and Boeing's sales for the next few years reached record figures. EOAC originally ordered sixteen aircrafts in 1987 as replacements for the existing fleet of 747-100s and Tristars. At that time, however, the EOA division were enjoying profitability and permission was sought and eventually received to order a further 30, with options for 30 more. Eventually, the airline was to receive 77. ...Boeing had really received orders for a further 77 747-400 from a single large airline? Well, going on the prices in the late 1980s, Boeing would be about $12 billion better off! EOAC would be the largest operator of the 747-400 anywhere in the world (BA had about 60 at last count, and UAL about 45) and would be a very valued Boeing customer!